Being a winner is what it’s essentially all about when you are playing bingo. Well not totally because the social aspect is very important too but winning makes it even better. Winner Bingo is for players looking to be in the winner’s circle of fantastic prizes. When visiting Winners Bingo for the first time you will be instantly welcomed with homepage that is bursting with a refreshing orange backdrop. You may find yourself wanting to reach for nice chilled glass of nature’s best; orange juice. But before you going running off to the kitchen take a look at what all is offered at Winners Bingo. You won’t have to register first to find out all there is offered because Winner Bingo is proud to show you straight away. The Bingo Tutorial gives a step by step instructions on how to register, deposit, withdrawal and get started on playing your favorite games leaving no room for confusion. The Social Features add to the bingo community charm where players can add a personal picture and customize their profile. Keep up with your bingo buddies with all the latest winnings and happenings by viewing their profile page. Add new acquaintances along the way to your Buddies List and never lose touch with them again. Powered by Playtech, players are assured of quality gaming with a reputation in the industry for excellent graphics and customer service. Winners Bingo is licensed and registered by Antigua & Barbuda Offshore Gaming. 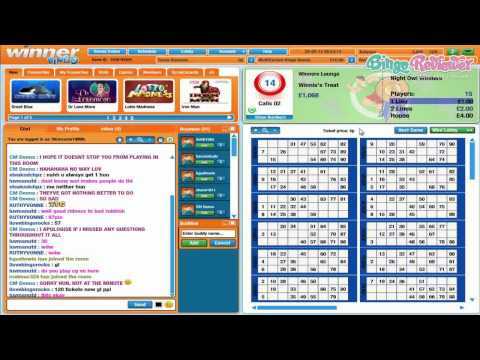 The bingo community is jumping with lively bingo action with two choices of bingo including 75 ball and 90 ball bingo. Bingo rooms offer unique bingo games like Deal or No Deal Bingo 75 where there are hidden values on the board with requires a bit of strategy to win big cash prizes. Or play the other Deal or No Deal Bingo where it is up to you to take the bankers offer or risk it all for the mystery case. Joker Jackpot where there are not one but two Jackpots up for grabs. Play 90 ball bingo with three chances to win on a card. Scoop up the Progressive Jackpot when you bingo on 30 numbers or less. Play side games with a host of gaming options including 80 ball bingo in Cash Bingo with a chance to win the huge Progressive Jackpot. Other games offered are Blackjack, Roulette, Keno and Hi or Lo Game Show. Slots are spinning like crazy with three types of varieties to choose from including: Progressive Jackpots, Multi-player Slots and Video Slots with amazing animation and graphics. Special features include Wilds, Free Spins, Scatters and multipliers on selected games. Take advantage of the First Deposit Bonus with a whopping percentage on your starting bankroll. This is good for bingo games only with a wage through requirement of only 4 times before a withdrawal can be made. Weekly Specials are conveniently displayed for quick reference. Play the Bingo Linx game that runs several times daily offering huge payouts to a single winner. BOGOF cards are available to purchase tickets at a reduces rate with buy one get one free daily in the Common Lounge. Free Bingo is open daily with 12 tickets Free per game and cash prizes up for grabs. The Winners Club welcomes its most loyal players with great benefits. There are 5 tiers of VIP and each level earns bigger and better Loyalty Points on wagers. The highest Level Crackerjack is by invitation only from the VIP manager. Winners Bingo is nicely laid out with for an entire gambling portal that extends beyond bingo with a full Casino and Poker client in on easy location. We rate Winners Bingo with 4.25 Pink Hearts. Winner bingo sure has a catchy name. Nobody would ever play at Loser bingo! And I like that their site colors aren't predominantly purple and pink. Winner Bingo has a couple of apps on facebook that are extremely popular. Slots Farm offers a collection of casual social slot games, with fantastic graphics, generous bonus features, free gifts and sweepstakes. Players can send and receive gifts and compete with friends. Super Slots lets you explore the world of MARVEL comics. With exciting graphics, entertaining gameplay and bonus rounds you can play along with your favorite superheroes. I'll have to say I'm a bit confused by some of the links on their site. "Bingo Tutorials", "our games", and most every tab takes you back to the social media info on the slots games on facebook. Hopefully they'll get that fixed soon so that you can get the correct information. Winner is one of the more popular sites in the UK, and one that has a TV commercial, so you have a feeling you know them from way before. The first thing that I saw was that they offer a £10 No Deposit Bonus. Real easy to get it, just register and without any deposit get the bonus. Bad news it's only for UK players. Too bad they don't offer it world wide. You do, however, qualify for the first deposit bonus (if you deposit at least £10), and you get a 300% bonus which is divided between Bingo and Games bonus. I was impressed with their promotions, and you will likely spend some time deciding what bonuses will you take. General advice is to make sure you read about the wagering requirements, and in case there is anything you don't understand, you can check it out with the support. I love the opening page when you log onto this site! It definitely gets players to smile. They give you a nice welcome bonus for joining the site as well. When you make an initial deposit of $10, they will give you $30 free. There is a wide variety of games to choose from when you play here. They have tons of bingo, slots, progressive slots, multiplayers slots, scratch cards and other side games. When it comes to bingo, they have the classic 75, 80 and 90 ball varieties up for grabs. They have plenty of rooms to choose from, including themed rooms and a speed bingo room. Their jackpots are pretty nice as well. Aside from the bingo I am a huge fan of slots and they have a lot of varieties to choose from here. My favorites are definitely the progressive slots because they are equipped with the biggest jackpots!